Of the many items of clothing Norma Kamali dreamt up in the 1970s – the designer propositioned a glamorous take on sportswear for the Studio 54 set in lamé and lycra – there is one whose appeal lingers. It was entitled the Sleeping Bag Coat – a padded, ankle-length jacket made, in its early iteration at least, from two sleeping bags stitched together and given armholes. Eminently wearable (it was as likely to be worn by Studio 54’s bouncers as the revellers inside) the Sleeping Bag Coat has not only survived the decades since, but set a course that has seen the puffa jacket become ubiquitous. Kamali may not have been the first – the down-filled jacket was first created for military purposes in the 1930s, and in fashion terms, American couturier Charles James created his eiderdown jacket decades before – but she popularised the style as a garment to wear both on the street and in the club. Part of the garment’s appeal is the way in which it cocoons the wearer from the outside world. Literally, for comfort and warmth, but metaphorically too – in the weeks after 9/11 in New York, when shopping came to a standstill, sales of Kamali’s coat peaked. So much so, her boutique, ailing at the time, was able to stay in business. Her shoppers were looking to clothes to protect themselves from the world around them. Fashion has long provided a mirror to its times and this season it reflected trying ones. 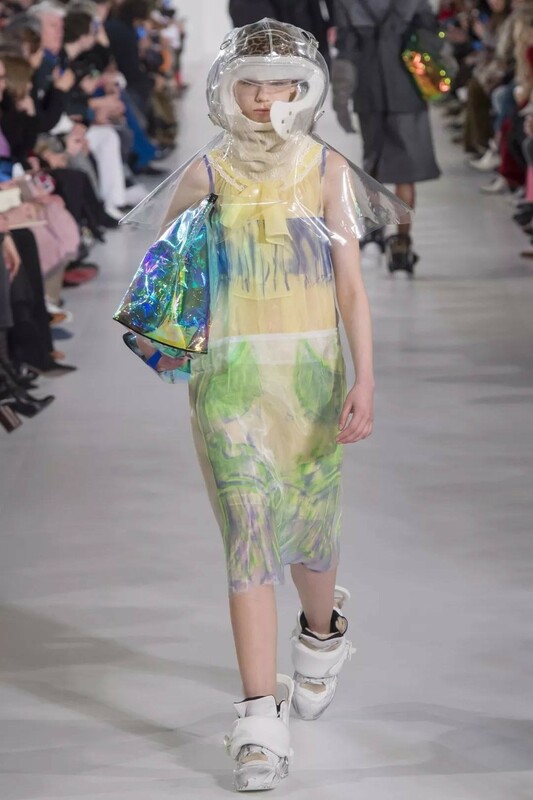 In the spirit of Kamali, the designers of A/W18 took to the runway with propositions for protection; garments that shielded their wearers from the elements. Of the 50 words that Raf Simons listed to describe his A/W18 collection for Calvin Klein – one for each state in the Belgian designer’s newly adopted home country – the most prescient to the collection was “safe”. Simons evoked it, he explained, in reference to Todd Haynes’ 1995 film of the same name, where affluent suburban housewife Julianne Moore is struck by a debilitating illness of no known origin. She deduces, over the course of the movie, that it is an allergy to the environment – plastics, pollution, additives, hamburgers, the list goes on – eventually succumbing to life inside an air controlled, antiseptic porcelain igloo. The film’s influence was felt, at times literally, in the clothing – the knitted hoods, something close to a balaclava, were lifted almost verbatim from the protective headgear that appears in the film, but the lurking sense of environmental menace meant a riff on protective clothing throughout. There were jackets and jumpsuits, firefighter orange that seemed to be dusted with ash; gloves, like those that might be donned during nuclear clean-up; emergency foil blankets refigured into scallop-edged dresses and hazmat waders. The backdrop suggested apocalypse – a burnt out barn, streaked with red paint; a floor buried in 50,000 gallons of popcorn – and these were the survivors. In a continuation of the season before, Simons sent the models down the runway with quilts, this time constructed in panels of dainty floral fabric, backed with tough metallic foil, held gathered in their hands. They suggested protection, but of a more intimate kind; the childlike impulse to wrap oneself up entirely. It was one response to a world increasingly underscored with danger, or at least flux – the lurking threat of nuclear armaments, climate change, abuses of power, to name a few – and the compulsion to protect oneself. In London, a week later, more of the same from Roksanda. 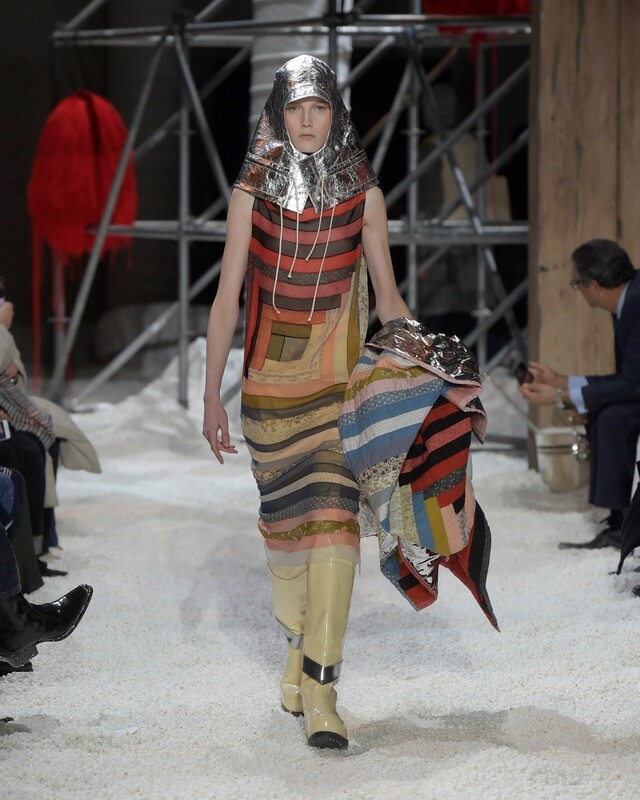 The designer wrapped scarves, padded like duvets, around models’ necks. 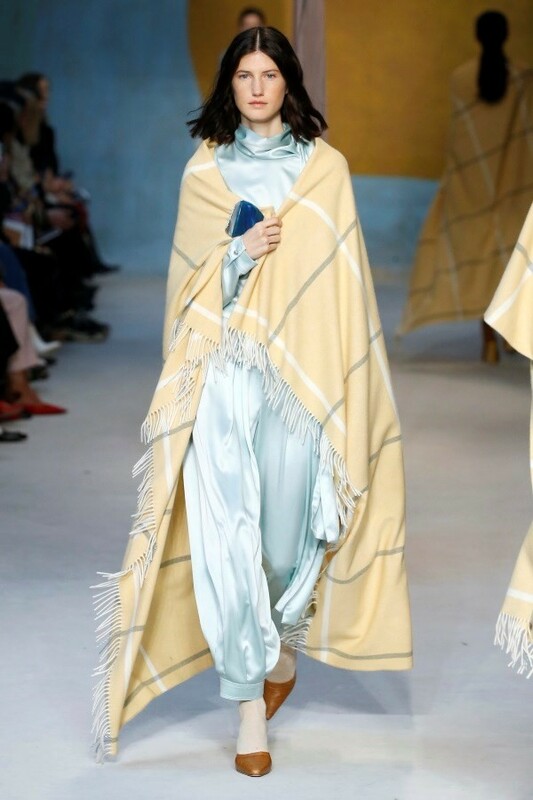 Some trailing checkered blankets became outerwear, others were simply held to the body. There was a soft domesticity to these pieces; if one was to retreat away from the world completely, what more comfortable way to do so? 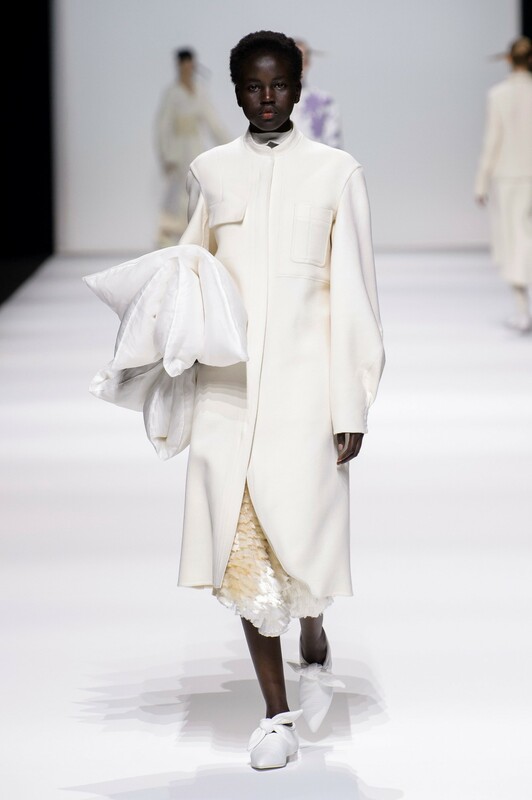 Perhaps you could turn to Jil Sander, where designers Luke and Lucie Meier cited comfort as the collection’s remit, creating bags that looked as if two folded pillows. In times such as these, why not sleep it off? Maybe that’s to miss the point. It is worth looking back to Martin Margiela’s original duvet coat, first shown by the designer as part of his A/W99 collection. Made by duvet manufacturers Featherlite, the vast piece of outerwear wrapped around the body as if the wearer had stepped out of bed. Ostensibly, in its cocooning shape, it suggests safety, but this is not an item of clothing for a woman in retreat. Instead, its sheer size makes the wearer unavoidable, transforming the body into a discordant new form. This was not a safety blanket but a statement. At the helm of the Margiela maison, John Galliano continued that designer’s legacy, albeit in a new spirit. He described his woman as dressing from the inside out, creating a new vision of glamour in the process. In iridescent foils, PVC headpieces and giant padded bags, his women were well prepared for apocalpytic futures, their piled-up clothing making for a strong physical presence. So too at Rick Owens, where the designer mused on sexuality, in all its “voluptuousness and crude sumptuousness”. Bulbous panniers hung from the women’s hips, a play on the bustle, and models’ bodies were swaddled in padded cashmere blankets. Here, the trappings of femininity became protection for battle.